I think it was me, Drew and Rowdy from when we took Drew on an adventure. Waste it. So I want to demolish my house in BP and most of the tree farm for my next project. Unfortunately this means part of the BryLine has to be rejiggered. OK. Where should I redirect it to? ie: what are you building there? Maybe I should just put the end at the Treehouse for now until you're done? Last edited by Bryson : 2011-06-01 at 14:26. If you connected the tunnel exit with the treehouse stop as directly as possible, that would work fine. For safety's sake I'll put the terminal at the treehouse for now. I can re-extend it when you're finished. I'd like to rebuild the footbridge from the treehouse to Bridgeport on a diagonal so it hits just behind the amphitheatre - I assume that won't be an issue? That would be perfect. The new structure won't be anywhere near that big. I'd be happy to assist here, as parts of the bar on the roof can be redesigned in this case. Also, if I'm allowed the claim, I'd like a moratorium on altering the dunes to the south and anything in the outlined area. I vaguely remember someone early-on mentioning the islands and the possibility of building on them, so if that person still has plans please speak up. Also, Bryson is looking for a winter spot. I told him that if I'm allowed the rights to the islands I'll give up my first dibs on the winter biome S of BP. RowdyScot has second dibs on that area, so if it comes to pass I'll let him and Bryson work out zoning issues. : That lower right of the rectangle should be more of a diagonal. Basically I don't want anyone altering the coastline, that's all. Although Atariboy isn't on often, I do believe the Jesusland fort is to the immediate right of that rectangle, attached to the skyway. No idea if or how much he had planned to work out to the west. 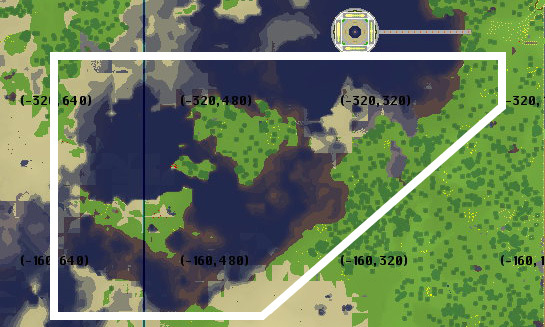 So, I've staked out a small fort in the winter biome to the south at about 1250, 0 and I'd like to use the snowy plain just to the north west of it for my next project. Rowdy, what were you planning? I'm planning to build an ice arena and a football stadium. One needs a biome with natural falling snow, and the other needs just a grassy plain, but I'd like them pretty close to one another. Not the easiest area to find, but I'd found it around the south parts before. I'd need to hunt again. Both structures will be kinda large, though I won't get to them until hockey season starts back up, most likely, at least if I'm being honest with myself. I'll go mark spots out when I'm next on, likely at some point later today (6/4). Getting too tired to do it now after a long day at Cedar Point. Yeah, sorry. After I posted the image I noticed that. I'm more concerned about the coast, honestly. Take that upper right corner and pull a 45 to the left and I'll be happy with that boundary. I vaguely remember someone early-on mentioning the islands and the possibility of building on them, so if that person still has plans please speak up. Ages ago I built myself a boat, floated away from BP, had to break the boat because of Parapa and build a new one, then set my foot on the middle island and claimed it proudly. I think I was the only one that wanted those islands, so: do as you please! The other fort by Atariboy is right across from his current one, but I don't believe it's attached to the skyway, but set out a bit from it. You might want to check your perimeters in person. Also, I built my work track just below the west skyway exit for sandmining, so I'll be sure to only barrage the land south of that general area. Thanks! I thought it might've been you. Does that interfere with the airport plans at all, or is it fair game? I really have nothing to put here, but I feel it's rather strange to not have one. That does not affect the airport at all. Robo has plans for the next chunk of land to the east of that area, opposite that waterway, but you might be in the clear. Robo? 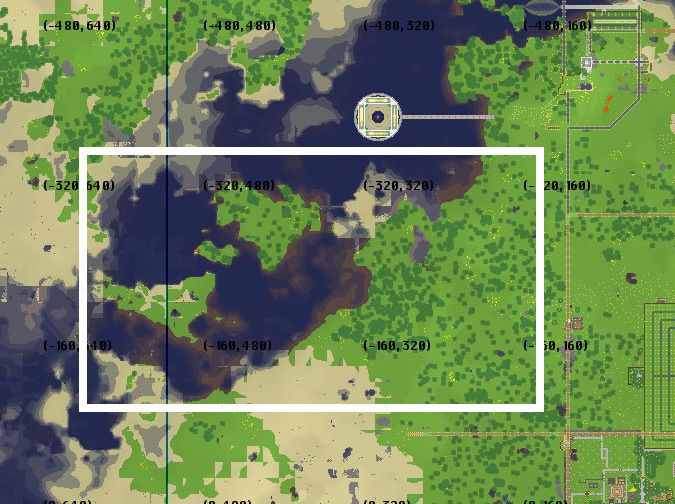 Please sir, where be the high-resolution map? I'd like to download it to figure out the shape of mah cavarrrrns!!! Thankee sahr!!! 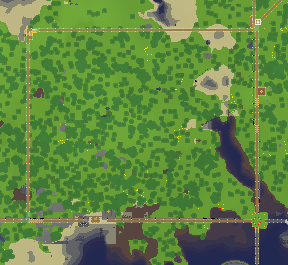 Check the thread called "AppleNova World Map and Screenshot Thread"
Go on and build there, RC. 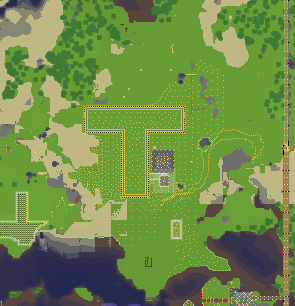 I was going to build something truly massive, spanning both sides of that waterway, but I think it'll be a while yet before I make any actual progress and I can always find another spot. So, here's a question for Turtle: Do you have future plans for or attachments to the area with your old (disabled) trap and big glass T? May I take it and repurpose it? I'm looking for a sizable plot of land for my next project, and I'd like to stay somewhat close to Bridgeport. This area would be perfect for it. If the answer is no, and you want to keep that land, then I'll claim this section way off to the NW near 709's flaming mountain. Just fyi, there's a diagonal tunnel that heads from Temple Station to the mine and a N-S tunnel that goes from the mine to the UFO, plus some assorted burrowing that leads from the tunnels into a cave system underneath that area. No current surface structures that I know of though. It'd be cool to have something over there, and it's not that far from BP. Would the land W of Olde London be big enough? I know I keep bringing that area up when people are looking for land, but it's just such a nice piece of property (and relatively flat) that I'd love to see something neat go up there. Hmm... tunnels could pose a problem because part of this project will extend underground. If I use T's former property, I believe the below-ground structure would be far enough north to not interfere with the underground tunnel that connects BP and Turtle Park to the east. I'll keep scouting for suitable places... not sure the spot west of Olde London would do, but if my other options dry up, I'll reconsider it. Well, I'm not opposed to giving up the tunnels. They were handy for night traveling before /tl came along, but now I zap from place to place most of the time unless I feel like a stroll. As I explore the caverns between Barfing Skull Pointe and all points elsewhere I occasionally pop up a stairway and an entrance hut. If anyone ever builds in the area over that way you'll have a way down to those caverns. As for the "T" Ranch Mrs T and I do have plans. One of involves a bridge (suspension style) from BP to the Ranch. A few other buildings and "community" of sorts. West of the "T" is open though. I don't know if you can fit you plans there though. That cactus farm can be taken down completely. I do hope you manage to find your next plot close though, I love your work! Take the NW spot then Brad. Even if /tl gets broken I really don't use those particular tunnels very much anymore.